Cloud seeding in Canada has become a big trend as a solution to help its residents combat intense hailstorms. For most parts of Canada like Alberta where it is susceptible to hailstones the size of golf balls, one can only imagine the damage it causes to homes and the infrastructure, all the more with concerns about the people’s safety. Pilots involved in the cloud seeding process head into the clouds like rain warriors, seeing almost nothing at first except the different shades of clouds enveloping their airplane. Shades of fluffy white being met by a dark gray mass, both views offer welcoming and risky emotions to the pilot in command. “It’s the exact opposite of what you learn as a pilot,” says Jody Fischer, chief pilot for Weather Management Inc. in Alberta that specializes in cloud seeding flights. Cloud seeding technology is also referred to as a form of weather modification where it produces rain to help in farming areas affected by drought and El Nino, extinguish burning forests suffering from wildfire or suppress hailstorms and rain that possess a danger to residents in that area. Cloud seeding demands a risk that only rain making pilots know. 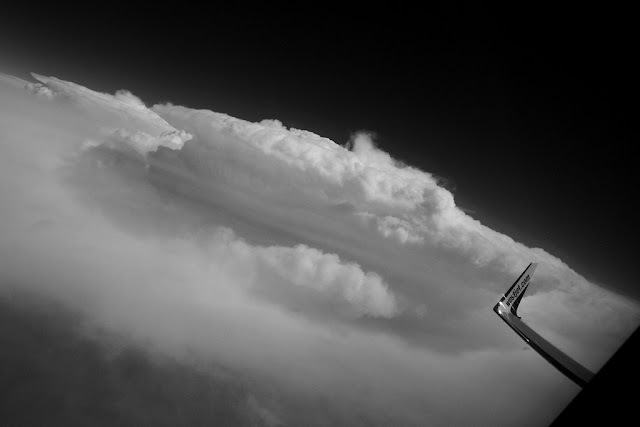 While flight school teaches a pilot in training the general tactics involved when flying in bad weather, these cloud seeding pilots do exactly the opposite: they fly into the clouds and fly just near enough the storm clouds. They have now become the go-to “cloud fixers” for places experiencing drought or damaging hail storms. The Alberta Severe Weather Management Society has a team of 11 pilots and three meteorologists working together hand in hand determining the best ways to fly directly into storm clouds to break up clustered hail. Most of Canada has experienced much havoc caused by thunderstorms and hail that cloud seeding has become a big trend to solve the problem. Summers are the busiest for cloud seeding with pilot groups like Fisher and his team spending most of that time flying into thunderstorms, spraying silver iodide into hail-producing clouds and feel good contributing to society’s safety. 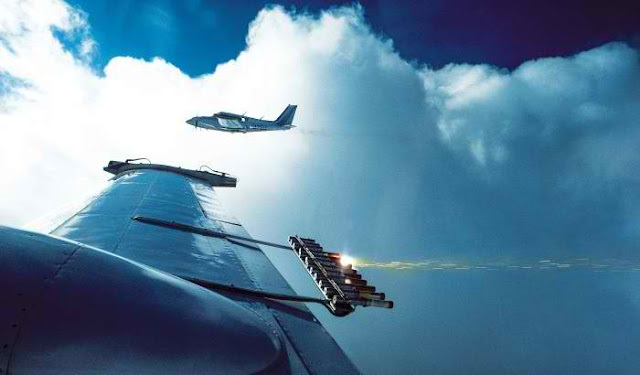 Cloud seeding is done thru flying or devices used from the ground shooting chemicals to change the amount or type of precipitation that gathers within the cloud. The most common chemicals include silver iodide, potassium iodide, liquid propane, dry ice (solid carbon dioxide), and even table salt. The common practice in cloud seeding is done by flying through the inflow of a cloud. The aircraft then releases silver iodide flares into storm clouds, dropping 8 or 10 flares, rockets or anti-aircraft shells at a time. These chemicals help clouds produce ice nuclei as it has a very similar structure with ice. Most often than not, clouds lack naturally forming ice nuclei. Once there is enough water that gathers around the ice nuclei it grows enough amount of rain or snow and releases them down to the ground. Injecting chemicals such as silver iodide helps the clouds generate ice crystals more efficiently producing snowflakes that fall as snow or melt into rain water. 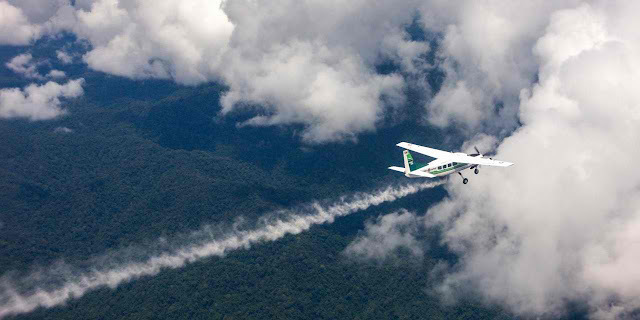 A regular twin-engine aircraft is mostly used in cloud seeding operations. Silver iodide flares are attached to racks that are commonly mounted on the aircraft’s belly and wings. Pilots need to assess and understand the timing of the life cycle of a storm’s cell by monitoring it thru a radar or visually. The pilot flies around and inside the cloud to inspect the quality of aerosols to determine its seedability. Once a pilot determines if a storm cloud is ideal for seeding, the silver iodide flares are activated and particles are released into the cloud’s updrafts. After that, the pilot flies 500ft (160 meters) around the base of the storm to determine the new parts of the cell that are inside new cloud growth. Top-seeding is done at around 20,000ft (6km) where the pilot needs to fly around the edge of the storm. There is much turbulence that is encountered during top seeding where the flight becomes bumpy caused by a big internal updraft, then ice forms on the plane where you fly through an area of liquid water, and another set of turbulence accompanied during a big downdraft. The pilot needs to maneuver between these sequences of until storm clouds are fully seeded and storms change in intensity and produce clear skies. When attempting to seed a particular area, cloud seeding experts recommend to fully understand the weather and natural cloud conditions in that area. Like in all things, it’s better to come prepared and well informed before attempting to do anything. Hail is a big problem in Canada. Imagine snowballs that size of golf balls falling from the sky, hitting you or your roof at top speed? Unlike golf balls, these snowballs are packed with from the core, so it’s definitely heavier than a golf ball. Multiply it a hundred times and you’ve got a violent problem knocking on your roof top. Canada has had its fair share of deadly hailstorms over the years. In 2012, Calgary was hit with hail and wind storms making it to the top ten worst natural disasters in Canadian history. Two years prior, golfball-sized hailstones showered the town, damaging homes and farmlands that amounted to over $400 million in insurance claims. Between 1981 and 1998, the town has seen over 13 storms that have caused over $600 million in damages. Numerous efforts to combat this calamity have been considered and among them, people have turned to cloud seeding. In 1950, Canadian farmers organized the Alberta Weather Modification Co-operative to help save crops. 20 years later, the Canadian government formed its own Alberta Weather Modification Board. Later, the Alberta Research Council added an armored plane to their cloud seeding efforts. The council found a 9% reduction in hail during one storm they studied through computer modeling. It may be a small percent but is considered to significantly help with the problem. The numbers may not translate to results that most researchers desire, but Canada has seen it work to their advantage. Over the years, cloud seeding has been the solution against terrible hail in Canada which was first funded by Alberta Agriculture until 1991 when private insurers took the lead in funding the country’s cloud seeding efforts after it was hit by a major hail storm that skyrocketed insurance claims. A lot of researchers say that cloud seeding produces insignificant scientific data that doesn’t prove cloud-seeding to work. There are also other issues involving the practice that isn’t favored by environmentalists but with the sudden changes in weather causing drought, damaging hail storms and putting people’s lives at risk, cloud seeding has become a highly in demand solution. Today, Canada’s cloud-seeding projects have a $3 million annual budget which is funded by more than 20 of Alberta’s top insurance firms. Pilots in Canada who head these cloud-seeding initiatives say 2013 was the jumpstart of their busiest year in nearly two decades with hailstorms in southern Alberta getting more intense and occurring more often today. 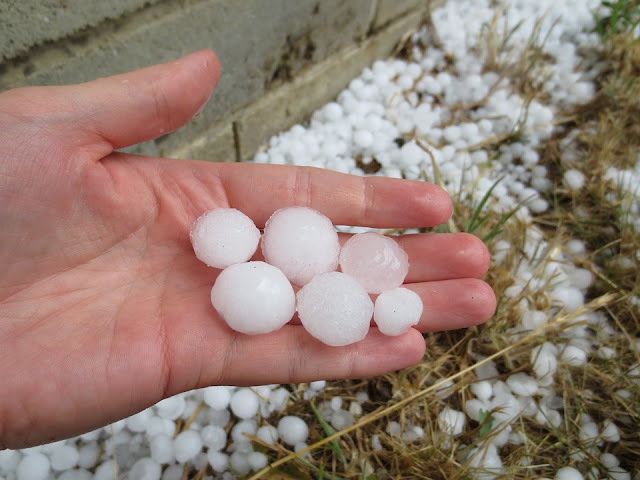 "Our radar data shows a definite decrease in the intensity after we seeded," says Terry Krauss, project director for the Alberta Hail Suppression Project. In 2014, the team has fought 92 hailstorms with the hope that it aids in calming storm clouds, making it rain or snow instead of producing hail. Cloud seeding is no easy task, especially for hail storm projects. Pilots who take on this mission put their lives at risk in the hopes that Mother Nature would respond positively and produce desired results. The initiative may be artificial in nature, but it hopes to make human life better by producing rain where it is most needed, dispersing fog banks near airports for a safer landing, and keeping people safe from calamities such as forest wildfires, drought, thunder and hail storms. Today, with the advancement of technology, drones are now being tested to cloud seed in place of planes. It presents a safer solution than sending out human pilots up in the air with the possibility to push the limits without endangering human life. It’s still currently being tested and may make its way towards different parts of the world soon and help with cloud seeding solutions. To these brave cloud warriors who charge through those storm clouds, we salute you! It’s a whole different ball game up there than just majestic cockpit views. Keep safe and wishing you blue skies ahead! Want to save the world and be a cloud seeding pilot? First, check out how to be a pilot in Canada here.